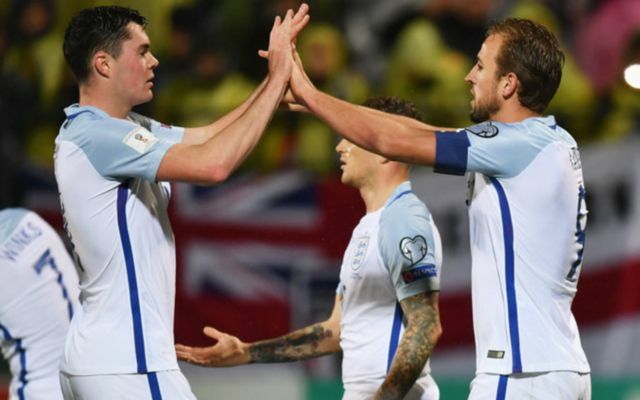 England had Harry Kane to thank tonight, as the Spurs talisman scored the only goal of the game as Gareth Southgate’s side finished World Cup qualifying in style with a 1-0 win over minnows Lithuania in Vilnius. Kane’s 38th goal of 2017, and his seventh in his last six Three Lions appearances, came in the 27th minute, as the Tottenham forward hammered home a penalty after Dele Alli had been fouled in the box. Chances were few and far between in this match, with one of the best coming in the sixth minute, after a cross from Aaron Cresswell seemed destined to be falling onto the head of Leicester ‘s Harry Maguire, however the ball was nicked off his head in the last second by a Lithuania defender. The game’s best player Harry Winks then nearly managed to make his debut one to remember in the 54th minute, after the 21-year-old fired a fierce left-footed strike at the home team’s goal, however Ernestas Setkus was equal to it as he palmed the shot to safety. The home side then nearly equalised two minutes later, as Michael Keane came very close to putting the ball into his own net, however Stoke shot-stopper Jack Butland managed to turn the ball round the post. England then very nearly put the game out of sight in the 68th minute, as West Ham’s Cresswell met a cross from Jordan Henderson, however Setkus produced a world class save to deny the left back his first ever England goal. For the home side, they’ll be looking to put this qualifying campaign behind them, and turn their attentions to qualifying for the European Championships in 2020. For England, they’ll be satisfied with this result and the qualifying campaign in general, as Southgate’s side will now look to turn their attentions to their warm up games against Germany and Brazil next month.